If ever there were a testament to PrinterLogic’s incredible scalability, it would be the case study of a federal government agency carried out by the independent research firm TechValidate (TVID: 9B7-248-E75). 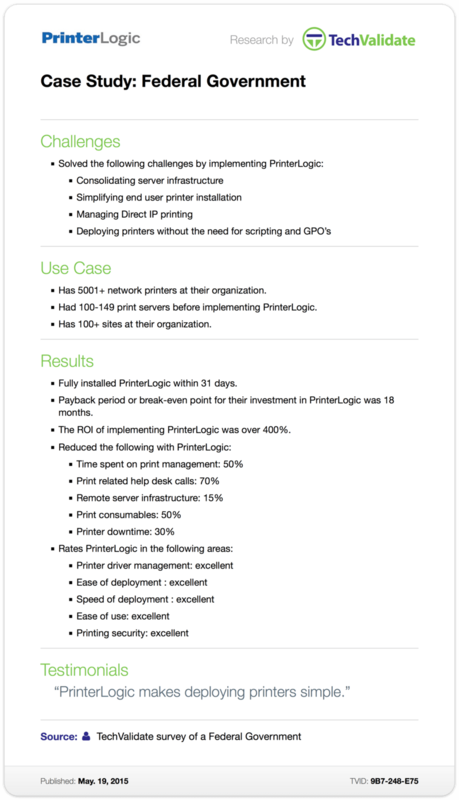 This agency had more than 5,000 networked printers and over 100 print servers before installing PrinterLogic across its 100+ sites. With a hardware count and distributed environment like that, you can imagine the massive logistical implications that any change to its enterprise print backbone would have. The number of calls to the service desk regarding print-related issues dropped by 70%. The time the agency spent on print management was slashed by 50%. Usage of print consumables such as toner and paper were also cut by half. Printer downtime fell by 30%. The agency’s remote server infrastructure experienced a 15% reduction. The federal government gets an awful lot of flack for not being cost-effective and streamlined enough. As this TechValidate case study shows, this particular agency is using PrinterLogic to address both in pretty significant ways.